Power Star Pawan Kalyan’s upcoming sensational flick Kaatamarayudu is going on at a rapid pace in Hyderabad. The latest update from this project reveals an important date. Touted to be a powerful action entertainer in faction backdrop, Pawan will be seen completely in Rayalseema style. The makers have released the first looks of Pawan in Dhoti avatar. Makers promised to release teaser as well but they postponed it from New year. Now the producer Sharath Marar announced the exact time and date for this flick. The teaser will be released at 7 PM on 14th of January. This has made the fans a reason to celebrate the festival with more joy. But due to some reasons this was not happened. But again date is locked for the teaser. The teaser of Katamarayudu will be out on January 26th on the eve of Republic Day. Producer Sharrath Marar has fixed the film’s release date. The movie would be released on March 29, 2017. This would be around the auspicious Ugadi festival. Kishore Parthasarathy alias Dolly of Gopala Gopala fame is directing this flick. 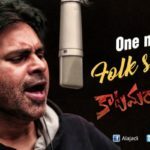 Anup Rubens is composing music and background score. Gabbar Singh lady luck Shruti Haasan is the lead actress.